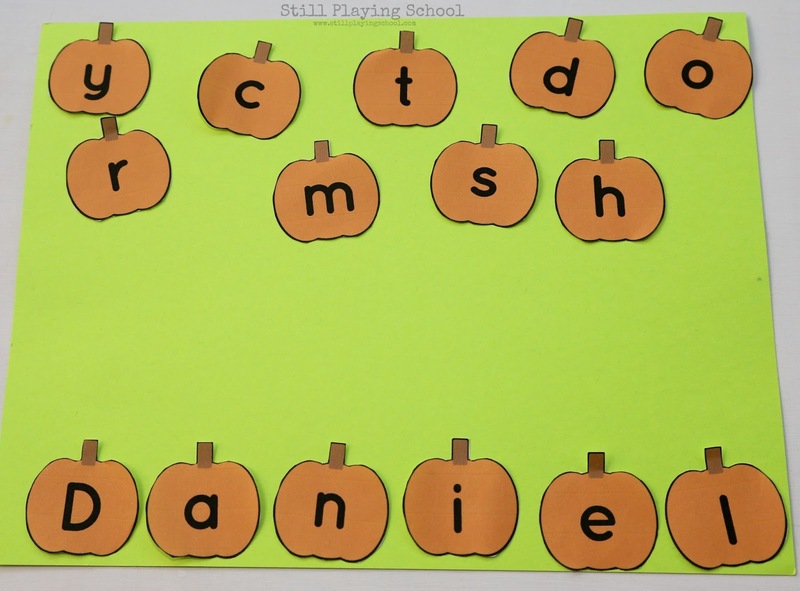 There are so many hands on and authentic ways to work with preschool children to learn to spell their names. 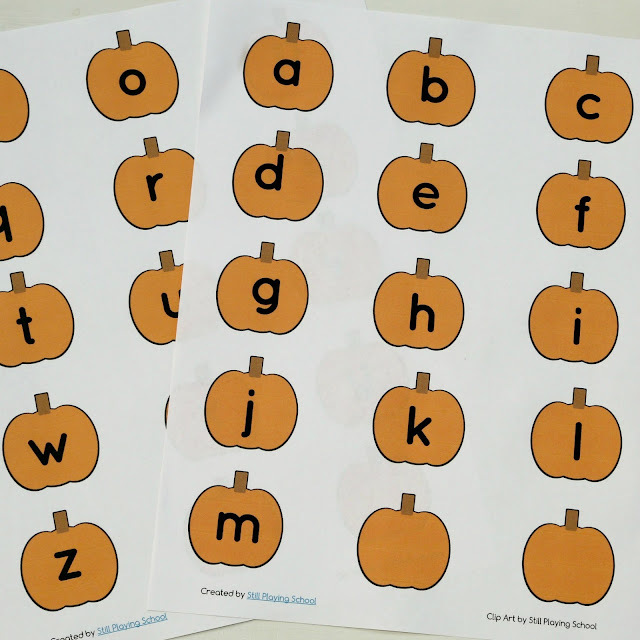 We added a fall themed twist this time by putting the letters on pumpkins for a free printable you can use at home or in your classroom! 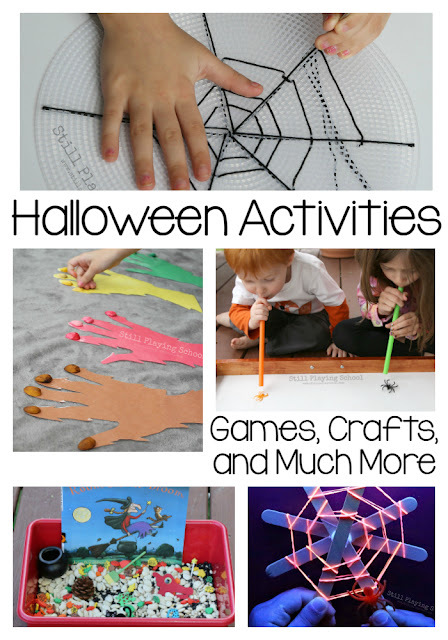 These will be perfect for teachers for Halloween literacy centers. too. We are absolutely loving this year's Virtual Book Club for Kids! 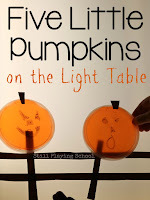 This week's book is Five Little Pumpkins by Dan Yaccarino. 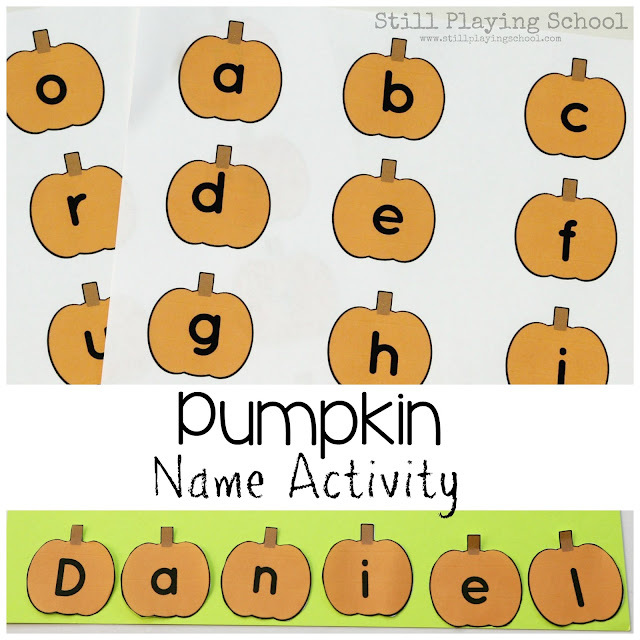 We've had fun with several Five Little Pumpkin activities in the past including a fine motor Five Little Pumpkins retelling and dry erase jack-o-lanterns to go along with the story. Check them out! We wanted to make this as simple as possible for you so we created our own Pumpkin Letter Cards that you can print and use in so many ways. 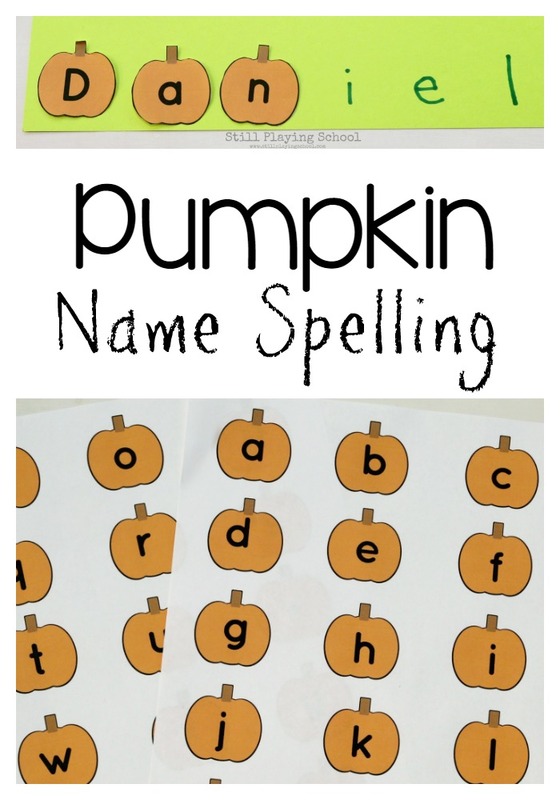 Since this first activity is centered around having preschoolers learn to spell their names, most of the pumpkins have lowercase letters. We used a green sheet of paper for our pumpkin patch. At the top I mixed the letters in our preschooler's name with several other letters. 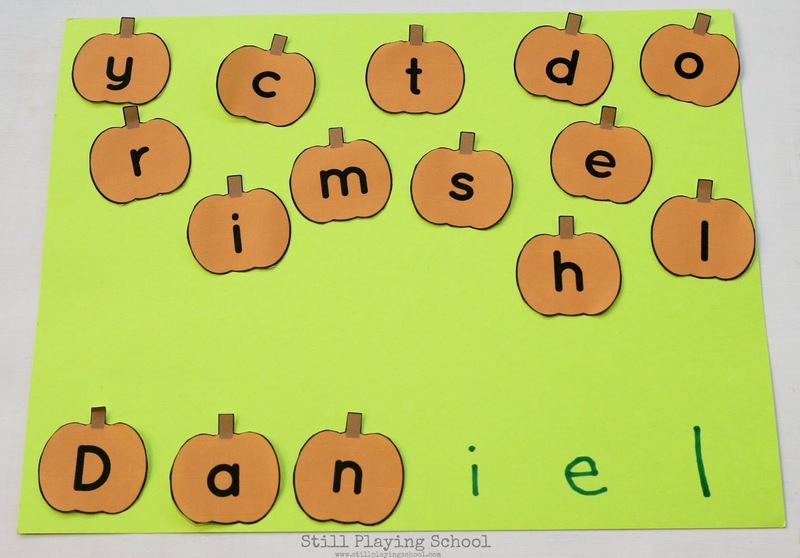 You can use as many or as few letters as you see fit depending on your child's ability level. At the bottom of the paper I wrote his name in marker so he could match the letters he needed to spell his name. Later I will challenge him to try this activity again without the letters written out for him. If you want to try this as a whole group activity or a preschool center, I recommend printing the pumpkins on card stock and laminating them for durability. I use my favorite laminator at home all the time! 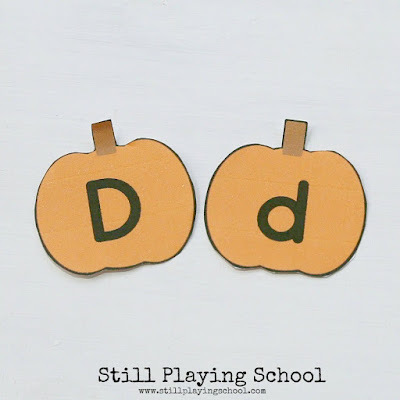 I see so many possibilities for this Pumpkin Letter Card Set! 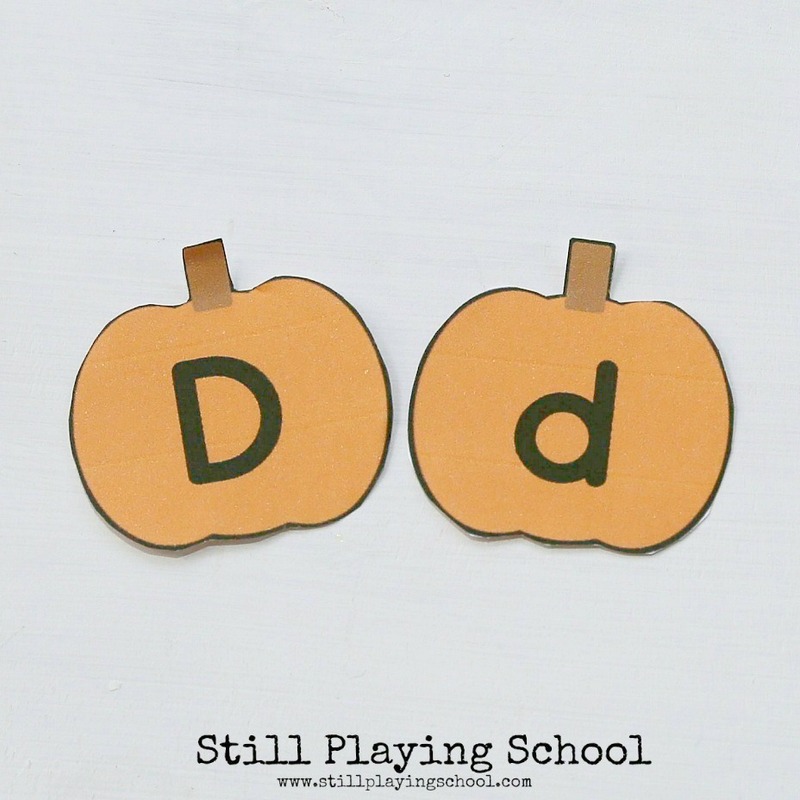 We'd love to see pictures of what you decide to use them for over on our Still Playing School Facebook page!